SALT LAKE CITY (AP) — A man who was stranded for hours in frigid weather with his leg sunk up to the knee in quicksand at a creek in Utah’s Zion National Park said Tuesday that he feared he would lose his leg and might die because the quicksand’s water was so cold. Ryan Osmun, 34, of Mesa, Arizona, told NBC’s “Today” show that he hallucinated at one point while waiting several hours alone after his girlfriend Jessika McNeill left him last Saturday to get help. Quicksand can form in saturated loose sand and standing water — the combination found on the river bed trail Osmun and McNeill were hiking, said Aly Baltrus, Zion National Park spokeswoman. Osmun had stepped into a small hole filled with it, Baltrus said. She left him with warm clothes and decided the fastest way to get help would be to swim down the river, which was waist-deep with frigid waters, rather than taking a trail. “I kept telling myself: ‘He would do it for me,'” McNeill said. After rescue workers found Osmun, it took them two hours to get his leg free from the quicksand. 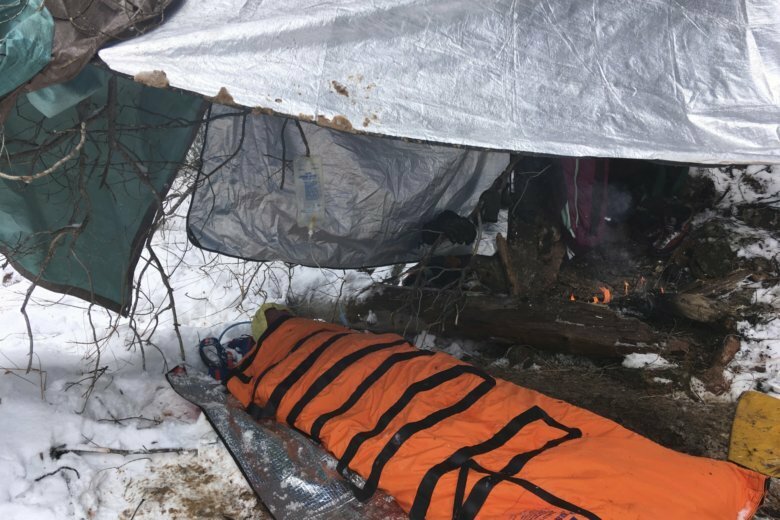 He was suffering from hypothermia and rescue workers needed to airlift him out on a helicopter but it was snowing so they all had to spend the night at the site. “If it wasn’t for them and Jessica, I’d be dead for sure,” Osmun said.